There are 48,800 farms in New South Wales. Each of these farms presents a high opportunity of an accident leading to either fatality or serious injury. There is an acute need for New South Wales farmers and their families to improve their safety on their farms. Alive and Well is the SafeWork NSW farm safety campaign, and was developed to inform farmers and their families about the risks and dangers of living and working on the farm. Having established the campaign, SafeWork NSW wanted to take Alive and Well to the next level. Given the potential to become the “go to” resource for all farm safety support and to inspire farmers and their families to apply safer farm practices, SafeWork NSW recognised the opportunity to apply a content communication method to the campaign. Following extensive work-shopping that included ascertaining the key features of the Alive and Well story, gaining a deep understanding of what the campaign is trying to achieve, as well as learning the needs of the target audience, contentgroup provided Alive and Well with a robust content marketing strategy. the personas that typify Alive and Well’s key audiences. 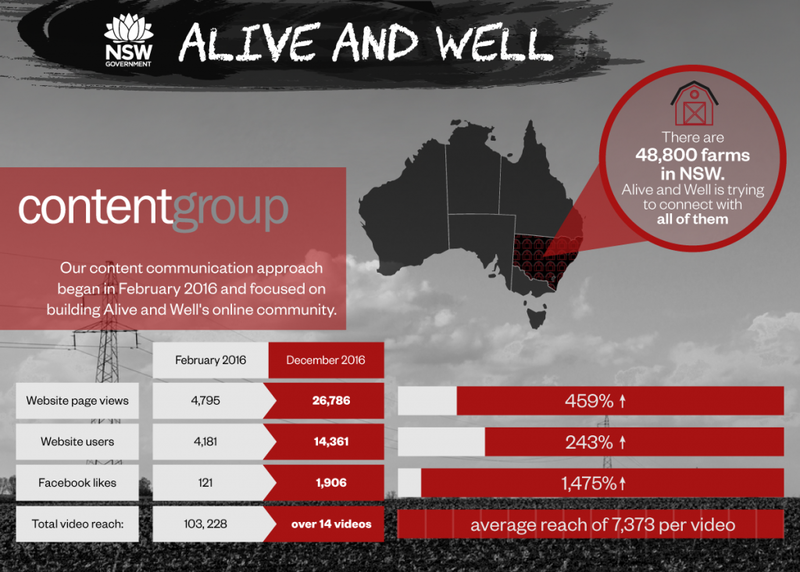 For the past 12 months contentgroup has been implementing Alive and Well’s content communication approach. This involves creating, curating and distributing content through Alive and Well’s website and social media channels, identifying PR opportunities for the campaign and providing regular, detailed and insightful monitoring and evaluation reports. The objective of the campaign is for farmers to share their stories so that others can learn from them and it has been positive to note significant increase in audience engagement. Between February and December 2016, the Alive and Well website received over 14,000 users who clocked up close to 27,000 page views. The Alive and Well Facebook page serves as a place for the farming community to regularly interact with one another, offering advice and words of support on topics ranging from safe use of quad bikes to depression and mental health issues in the rural community. This has allowed the Facebook page to grow from 125 to 1,906 likes since the content marketing strategy has been implemented.